COSMIN aims to improve the selection of outcome measurement instruments both in research and in clinical practice by developing methodology and practical tools for selecting the most suitable outcome measurement instrument. You can use our tools to improve the way you do research and the trustworthiness of your results. Get the definition of your measurement properties clear with our consensus-based taxonomy of measurement properties. Save time searching for the best available outcome measurement instruments with our database of systematic reviews of outcome measurement instruments. Use one of our checklists for assessing the methodological quality of a study on measurement properties. Identify all relevant studies in PubMed and Embase on measurement properties effectively with our search filters. A 10-step procedure to help you conduct your systematic review of outcome measurement instruments. Improve your COS development with our systematic and consensus-based guidance. COSMIN is an initiative of an international multidisciplinary team of researchers with a background in epidemiology, psychometrics, medicine, qualitative research, and health care, who have expertise in the development and evaluation of outcome measurement instruments. We call for standardization of outcomes and outcome measurement instrument selection by developing core outcome sets (COS) and universally applicable IRT-based instruments. COSMIN published the book Measurement in Medicine. 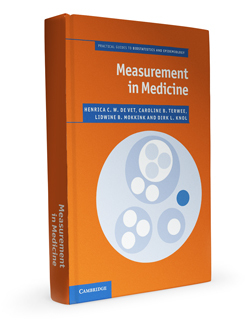 It provides practical advice, underpinned by theoretical principles, on developing and evaluating measurement instruments in all fields of medicine. This is a perfect course book for students and a perfect companion for professionals/researchers in the medical and health sciences who care about the quality and meaning of the measurements they perform. We also teach a three-day course in Clinimetrics (twice a year, in English and Dutch), based on this book.